The Bhoys are all the buzz this upcoming 09/10 season! 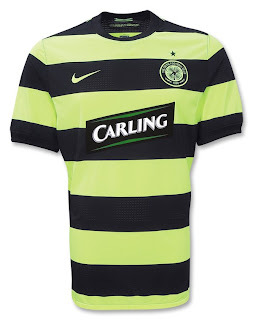 So, here's the brand new Celtic Football Club Away 'Bumblebee' Soccer Kit. This cool new kit is sure to be popular amongst all Celtic supporters, and hearkens back to the famous 'Bumble Bee' design worn by the team in the mid-1990s. The shirt features embroidered Nike Swoosh on right chest and club crest over the heart; and felt Carling sponsor design on center. 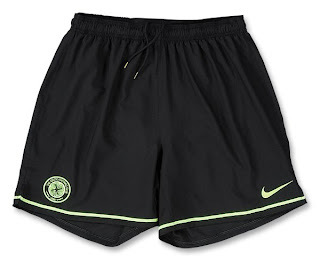 Made of Nike’s advanced Dri-FIT® fabric, which keeps you drier, cooler and lighter by drawing sweat from the body to the fabric’s surface, while its three-dimensional construction gives more air space around the skin to reduce clinging, and keeping you cheering on your team comfortably.